Yesterday, we revisited Sundernagari, the site of the project we did last year in which we experienced a fairly intense community involvement process to redesign a slum in-situ. One of the first questions we got asked was if we knew whether the scheme to redevelop the slum would take off. 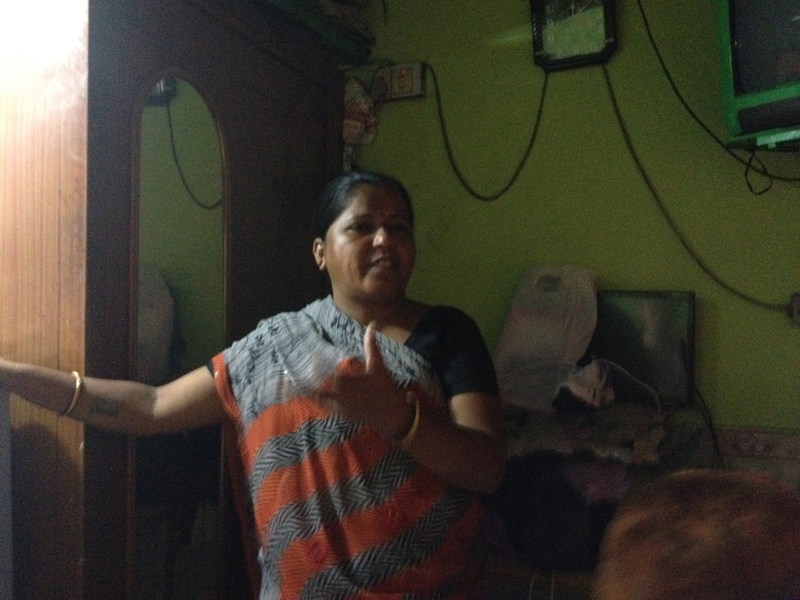 Kokila Ben, the member of the women’s cooperative run by SEWA Bharat and MHT, had been fending questions by community members asking if they should invest in adding floors to their homes. Already, we saw several homes had been added to or were in the process of doing so when we walked through the neighborhood. The home is a matter of emotion, pride and sustenance for anyone, more so for the poor and especially for this community where most people practice home-based occupations. A mochi community, nearly every home has its male head sewing and repairing shoes, while women support the house by venturing out to sell shoes or, in some cases, working as domestic help in middle income homes nearby. Kokila ben is an eloquent, down to earth woman who sells the shoes her husband (drunk the day we visited) makes because the cops harass women less than the men! I was struck by how much lower the activity levels seemed as compared to last year. When I asked, a tale of woes and apathy spilled out. Apparently, the Lal Qila market where these people sold their finished products is being disbanded and moved to the defunct Power House near ITO, which will take a while to attract customers. As of now, the shoemakers are selling from their basti and constantly being hounded by the police for what they claim is illegal work. It is clearly hard to make ends meet, and with kerosene halved on their BPL ration cards plus hiked electricity rates, they were tightening the belts for tough times ahead. One mochi brazenly asked us for a loan to grow his business and claimed he could make chappals to our design specifications if we wanted to try him out. 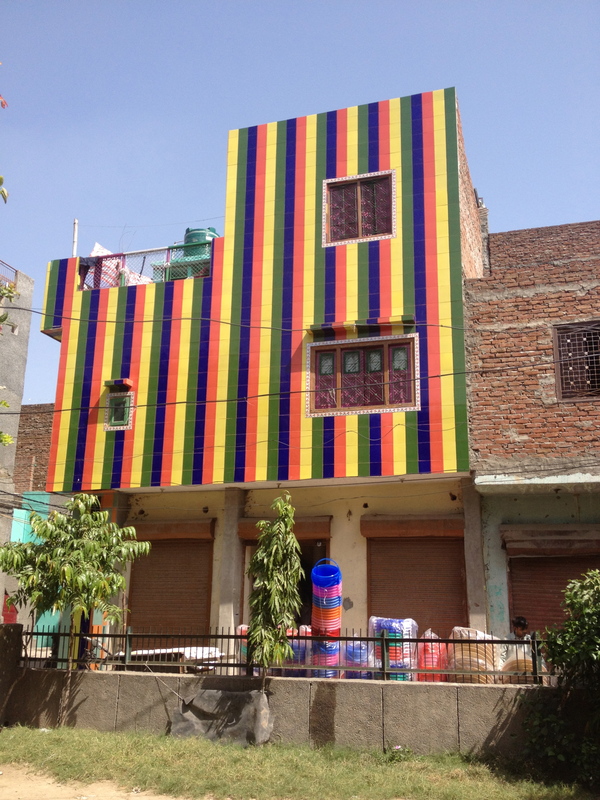 Walking around the basti, we saw some other very interesting occupations. A wizened old lady was sticking pins into tiny pieces of plastic, apparently a component that goes inside a bicycle horn. Another woman was putting together two small bits of plastic to fashion a whistle. These little components would then be fitted by someone else into the colorful plastic cover that we associate with the whistle! Other home-based occupations we ave noticed in these slums are buffalo rearing, which makes for an interesting though messy situation, metal fabrication to make things like birdcages and rat traps, jewelry making out of beads and sequins, embroidery and needlework, stitching and carpentry. Quite an array, isn’t it? The old lady bent over her horn components! 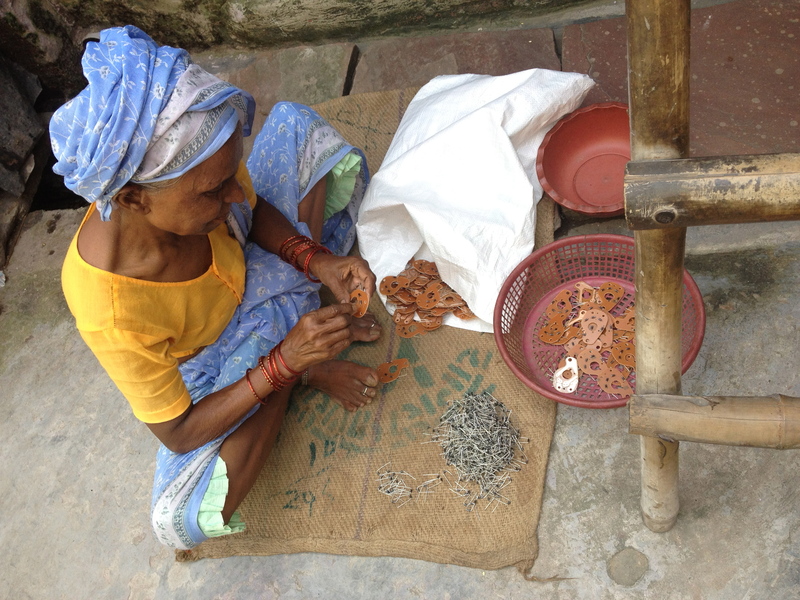 Indian communities have such a strong traditional of skilled handwork and handmade items of all kinds. The level of finish may vary but these people take pride in what they do. Most of these are non polluting, take very little energy and gives livelihood to scores of people. Certainly the city would not be able to provide employment to all these people if they stopped doing what they do. Yet, we place such little economic value on these tasks, and our legal system declares many of these home-based activities to be illegal, subjecting these poor people to the misery of harassment and corruption. It sees to me rather unfair and I wish I knew how to help these communities with better linkages to the supply chain, some means to reduce exploitation and increase market value through design inputs, branding and skill enhancement. Shashi Tharoor puts it succinctly in this article. India has a lot more going for it than the macro economic indicators suggest. 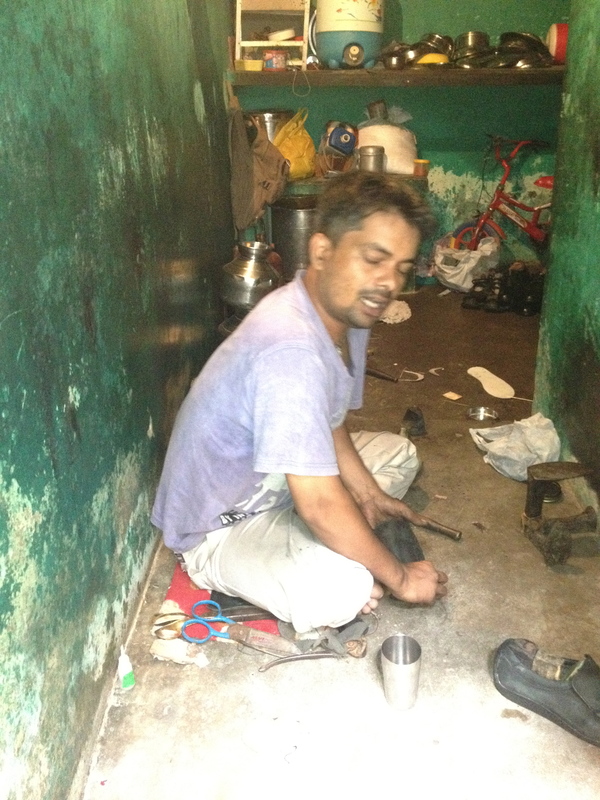 He talks about frugal innovation or what we know better as jugaad. This is a cornerstone of the Indian psyche. Whatever be the situation, Indians will find a way around myriad obstacles to get ahead. It puzzles me that this jugaad mentality of finding innovative solutions to problems both simple and tricky does not extend to community issues. We Indians are comfortable thinking in terms of the family unit. In the days gone by, the biraadari, loosely translated as the community, was based on certain elements that bound families together. Caste and sub-caste played a strong role here and this had a correlation with the occupation and therefore lifestyle, that included eating habits, dress codes, language, mannerisms, social structures and codes of conduct, etc. After independence, India has struggled to establish a democratic society despite the fact that most Indians associate themselves with a biraadari or kaum; that is what drives their identity, that is where allegiances lie, the people within the biraadari are ‘us’, everyone else is ‘them’. This sort of thinking has posed as an impediment to the establishment of a nationalist thinking as well as to the nurturing of democratic values. Modern societies, especially in the urban context, are diverse and multicultural. People from an astonishing array of backgrounds live together in new forms of community, like apartment blocks and gated colonies, or work together. It will take us time to establish common ground that is not based on the traditional concepts of biraadari. I see this where I live. Despite being educated, serving or having served in government service or the armed forces, or in senior positions in corporate organizations, I observe that people often feel most comfortable forming groups that have caste and region as the binding factor. Religion, of course, and language, are very strong elements in social interaction across age groups. Younger people do deviate from this trend, and world view, political leanings, income class and aesthetic tastes become differentiators basis which we decide who our friends are. Perhaps this is because they are idealistic and still willing to trust most people; they haven’t been stung by the bug of cynicism and social interactions are not about seeking safe havens, but about creating excitement. I would like to think that a new social order is emerging in urban India, but to be honest, the robustness of this new order remains to be seen. I have no doubts, however, of the urgent need for this new social order. The creation of new common ground for people to come together is essential so that we can harness the power of innovation for the community, not just to further individual aspirations.